André has been organising this event now for 30 years. They've made an invaluable contribution to making catering available for 2012 & 2013. It's also Paul who has structured our committee. 2012 and future years open-up with 2 more of us helping the event to go on! Karen facilitated and is managing the excellent "early bird" bookings. Also improving the site through her writing of HTML. Jonathan also has made worthwhile contributions. John Pitcock helpfully keeps the Long Weekend advertised elsewhere on "the net". Adrian has done lots in the kitchen in recent years: most especially providing a dependable supply of hot drinks. Linda and David kindly hosted visiting dance teachers from The Netherlands. Charlotte kindly made her home available for dance teachers in 2012. Profound appreciation is due in this anniversary year, to Wendy and Betty. Allowing trial of a lovely new way to start off the Long weekend. - and it's only for this - PREPAY to BOOK YOUR PLACE. Essential £6 beforehand please, to take part. Also book to share with us this lovely meal prior to Geoff Cubitt's American Evening. If paying by "Early Bird" (or by "Later Bird") meal payment details are on that page. Otherwise your form is here to click ! This COMING weekend. It's our 30th anniversary event. OK - Spring is late - Cool ! Visit & enjoy what there is at Gt Alne. Karin Bellaart from The Netherlands - is our main teacher of International Dances. KARIN's REPERTOIRE from which her dances will be selected, you may view it here. We have fliers here - (and modifications - which assist you to inform others in your own dance group). Evening Dance or Day visits welcomed: Great Alne Long Weekend: Our site's Home page. Contact us -here. Do refresh any page tab of your own, if checking for latest information: and to print off current payment forms. Hi - JUST until the 25th, you can be an "Later Bird" ? or be a Drop-by casual visitor this coming weekend ? BIRD Booking form here NOW - view form - later choose icon (some variation according to your web browser) to print/magnify. "Early Bird" payment EXTENSION details. 1. Download, print and complete these booking form/s with names of all to be included in your payment. (Please note: In the event of unforseen circumstances, this "E or L Bird" payment is not normally refundable. Do you now wish to be a "Later Bird" before April 25th? or a Drop-by casual visitor during this weekend? Extended Bargain "Early Bird" SeasonTkt to ALL of Gt Alne Long Weekend (see below: forms ARE HERE). The bargain "Early Bird" SeasonTkt has its extended PAYMENT DEADLINE to 22nd April ! To view the detailed programme of dance and activities, click to view each day. if so please download instead, clicking here. Visitors: Molly is wild fun for all, Edmund leads the action in full regalia, accompanied by live music. A lively rainbow branch of Morris dance. From 1.20pm Sunday. Great to drop into; easy to share in the fun. Equally interesting for an interest visit is the Maypole dancing before this, and the Handbells afterwards. Any visitor - especially with interested young children, is likely especially to find joy taking part in these. Watch your kids enjoy; YOU have a try too ! And eat‐out with us, should you wish ! Based in Cambridge, Edmund Croft dances with Gog Magog Molly. View them at their website 1 & website 2. Monday's leisurely hour - set aside to sit at tables, usually inside the Memorial Hall. We enjoy a delicious choice of meal. Or click on Fullscreen just below here, to view. James Hobro - It is wonderful to have our originator of part song back gain after several years. Beginners through to sight-reading singers are welcomed at his excellent leading of Part Song during Saturday. After your friendly participation: you may share a short performance of the 2-3 songs you've harmonised together (usually in 4 parts). Should you wish the group to sing your own favourite material, Please now email your precise request details. here - link to email James. Here are fliers addressed especially to other Scandi dancers. There is always at Great Alne, several dancers who delight in Scottish Dance. In 2012, we were privileged to have a Nicola Scott Scottish Evening. Unfortunately, a Birmingham RSCDS event frequently coincides with our Saturday evening. However, here are fliers addressed especially to Scottish dancers. and enjoy Nicola's early Monday workshop. These 2012 details give you presently some guide as to how the 2013 event will be arranged. Hi - JUST FOR THIS MONTH, you can be an "Early Bird" ? or a Drop-by casual visitor at the end of April ? Do you wish to be an "Early Bird" ? or a drop-by casual visitor at the end of April ? We ask an "on the door" increase from £10 (since 2008) to £12 for an entire daytime price. 2012 Gt Alne Long Weekend began on the Friday Evening with Music/Dance in the Memorial Hall. Karin's bright, lively manner is hard to improve on. We look forward to Karin's visit, bringing another delightful dance selection. A range of hot food, (+ vegetarian choices), soups, sandwiches/yummy cakes to be available - lunch & evening. Here soon a few more details of general menu choices Plenty of choice will be available. A range of hot food, (+ a vegetarian choice), soups, sandwiches/yummy cakes to be available - lunch & evening. You'll soon have more details of general menu choices and a programme. We will therefore repeat a similar arrangement this year. We are shortly to announce details of Friday early Evening's more special meal. Monday is again to feature tables-out in the Hall. Quite small Mon numbers, mean we will not invite outside caterers. The proprietors of Lakes Bistro, Alcester High St; had catered at Great Alne Long Weekend for 4 years. We wish Amanda well in recovery from her problems with high blood pressure & diabetes. The proprietors of Lakes Bistro, Alcester High St; have catered at Great Alne Long Weekend for 4 years. A range of hot food, (+ a vegetarian choice), soups, sandwiches/yummy cakes still available for lunch & evening. You'll find details of general menu choices in green on the programme page for each day. You pay one price to allow you to partake in the whole series of daytime workshops. Similarly in the evenings, there's one price for the music start-up, plus a whole evening's varied dancing. By pricing thus, we hope you try-out several forms of dance: (something you've not done before?) And perhaps try playing some music too. Please also sign-in and volunteer at least a small contribution towards our costs of hall hire. Note: YOUR responsibility is for YOUR SAFETY if dancing, walking, cycling etc. Parental responsibility is for safe, sensible behaviour of YOUR children. Personal items in the hall. Leave in view in front of the stage, else at the very back of the stage. Please NOT at the hall sides. A danger for dancers ! Sides of this hall are NOT a safe place for personal items, or to set-up chairs. Please take back any chair you've used as you get up to leave it. Do NOT let your bag or chair become an obstacle causing a dancer to FALL! Join dance, music, song & more. Share a joyful, active Spring break ! "Early Bird" (details on this site) from December to the end of March for the April 2013 Anniversary Event. Dance patterns in 2013 hopefully through daisies around the Maypole. Join to play music, share Song, ring handbells & more. Not to mention the fun of Border Morris or undoing those patterns plaited around the Maypole. Evening Dance or Day visits welcomed: Great Alne Long Weekend Here: our website Home page. - FULFILMENT for those who dropped by for a visit: and for ALL who came to enjoy the long weekend with us ! For EACH site overnight please add this- (Whether in Caravan, Campervan etc. Monday 30th April 2012 PLAN IT - AND LOOK AHEAD NOW - Take a break. And lots of time to chat too. A "carpet of white" with Its spectacular wood anemonies. These were outstandingly beautiful in the late springtime of 2010. The primroses, orchids and cowslips are there too ! Altogether a Spring experience not to miss. Bus 26 from Stratford. NOT on Sundays. NO BUS SERVICES at latest, after about 7pm. Check internet details. Click on Bus 26 from (& to) Stratford timetable. An extra few OK 26 buses take other routes. Bus 26 from Redditch (to Stratford) approaching Great Alne via Alcester. You should get offered a lift back after the Long Weekend. However, here is the daily service timetable from near the hall to return to Stratford. Bus 26 departing. Click on Great Alne for Stratford - daily timetable. Happening on Sat & Son and on the more gentle Monday afternoon. Paul instigated this many years ago, bringing along the lovely set of handbells which he skilfully restored. This action - near the middle of the day on Sat & Sun is great to drop into, and easy to share. All Blacked‐up. A great highlight especially for visitors on Saturday and on Sunday. This action - near the middle of the day, is great to drop into, and to share with easy participation. Julian Stanley will, we trust in 2012, again take us through more Fixed-pattern French Set Bourées. There will be social dancing on Friday, Saturday & Sunday evenings in 2012. Bonus late dances too! Hot drinks are included in the entertainment breaks! To find out full details, click the Last Event p1or the Last Event p2pages. - to find out more, have a look at the Last Event p1or Last Event p2pages for the draft Programme. The different kinds of workshop, right through the daytimes, have variety from year to year. At popular times, parallel workshops take place while there is dancing in the hall. You'll find the song group and handbells outside when we're lucky enough to have sunny weather! Monday in 2010. Workshops, served lunch & walk times 2010. For interest, LAST year's Monday PROGRAMME - cLICK BELOW on -"Fullscreen" to view it clearly. Great Alne is VERY SOON Saturday 9th April to Monday 11th April. Information Poster above. Many thanks if you can print and distribute this, or/& the 2 programme sides (Sat & Sun/Mon) to help our publicity! For your own copy, click on - "Download File" right below it. This collects the document to your own computer. You may then print this programme. No pre-booking is required, you may gladly turn-up at ANY time. Join in ! come in ! sign in - And please make an apt financial contribution ! Saturday & Sunday - wonderful for visitors sampling, as well as for those staying. Monday - Summarising workshops, served lunch - Oversley Wood walk - A special day. 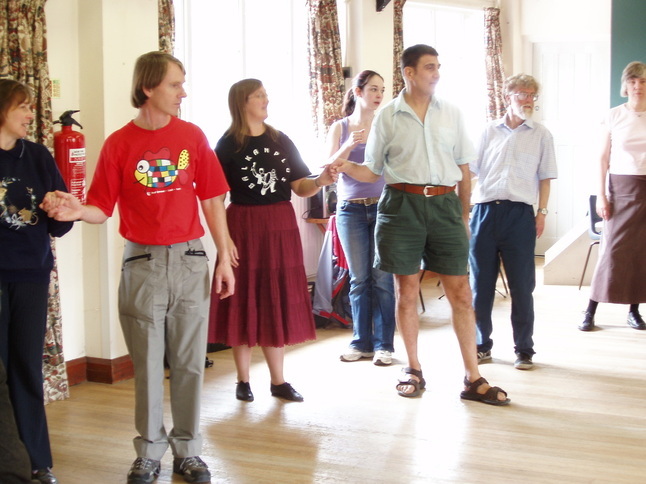 SAMPLE WHAT WE DO - varied dancing, music, handbells, walking, cycling & more. See Activities. Accommodation Ideas: on the Accom'n/Contact/Links page. Map, route directions and an interesting selection of walks are on the map/walks page. Our superb Caterers let you enjoy all this with no need to prepare sandwiches, or to cook at home. An online menu may be displayed next year. Programme details for each day are displayed. Do print a copy for yourself. Sat shows p1. Sun shows p2 (plus Monday's details). Do help our publicity ! Please print, then pass programme around YOUR dance group to show what will take place. Linda Moon is unfortunately now unable to take part in the long weekend with us. (The programme has needed to be amended). We do hope that Linda - a regular contributor for many years - will be back to dance Cajun and more with us next year. Wishing to bring a caravan ? Please ring 0121 777 3722. Leave YOUR name/tel if no immediate reply. PROGRAMME - cLICK on -"Fullscreen" to view clearly. For YOUR own copy or to kindly help publicise please "Print". Hoping that this working programme will need no more changes. Refresh if necessary. Tai Chi with Yang, we HOPE we may look forward to enjoying. Circumstances intervened to prevent us from sharing these last two years, her skills in this lovely ancient Chinese tradition. Yang is one of the most capable: visually probably THE most stunning practitioner of Tai Chi Kung Fu Sword in the Midlands. We survived several very energetic dances from Orsolya Vegh in 2010. Based here in the Midlands, Orsi pronounced (Orshi), originally from Hungary, will share again some of her vibrant, mainly Moldavian/Hungarian dance repertoire. Linda Moon will we expect, again spend all of the long weekend with us. Linda will present more of the many kinds of couple dance in which she specializes. Relax dancing them, and enjoy the mood. Do you wish to bring a caravan ? Please ring 0121 777 3722 soon. Leave YOUR name/tel if no immediate reply. There will be social dancing on Friday, Saturday & Sunday evenings in 2011. Bonus late dances too! Hot drinks are included in the entertainment breaks! To find out more, click the News page. - following later will be a draft Programme. Monday's gentler active day began with music. This is everything we did on the Saturday in April 2010 for the Great Alne Long Weekend. This April's Sat. programme - to be published here soon, will show a similar pattern. I want to express my gratitude, and here is a fairly suitable place for me to do this. And both by your helpful progress, you have rather shamed this often rather slow, inefficiently directed and forgetful old guy. Thank you Paul for your quietly effective manner, hospitality for your thorough meetings, the ideas you've followed through, and the approaches you have made. My hat is well removed in acknowledgement !! Nicola - Thank you so much . You are always very busy and conscientious in organising elsewhere. And the helpful design of those cracking little fliers is invaluable too. Monday's gentler active day begins with music & song. Join us to share Sunday's varied activities. Got a bike?? All Blacked Up! BE THERE ! Enjoy Richard - contributing in his full regalia at 12.50. You may join-in without blacking-up! Monday view workshops, served lunch & walk times. A leisurely hour set aside to sit at tables, usually inside the Memorial Hall. We enjoy a delicious meal. There's great choice costing less than you'd reckon from the quality. or if you wish to contribute activities or ideas, please send feedback or tell André, Paul or Nicola. If you've pictures or video of earlier years, please email to us. It would be great to include more of these on the website! It will be good in 2012, to hear much more of the musicianship of Olivia and Richard Hunt. They intend to spend much more time contributing to the event. Below - 2009 memories: Great Alne Long-Weekend. Events have similarities from year to year. Saturday daytime workshops and Evening Dance. This year's programme - to be published here soon, will show a similar pattern. Sunday daytime workshops and Evening Dance. Here, this is a DATA storage page in case of future use. (Whether in Caravan, Campervan etc. Opportunities for your active enjoyment on Saturday. Click above on Saturday or Sunday or Monday for each day's programme. And for Prices also. The News page for now, conveys most about this April. There will soon also be a draft Programme. Gt. Alne Memorial Hall. An International Dance is explained by Nel from the Netherlands. We are hoping that Adrian Pointon will return with a new selection of his Israeli Dances. And we would also welcome Cindy Pointon again to lead Circle Dances. We hope to hear much more of the playing of Olivia and Richard Hunt in 2011 - with Adrian joining in playing too. We hope we may enjoy Tai Chi with Yang. Walking near Gt Alne Church. a Friday St. George's Evening Extravaganza at Great Alne Memorial Hall in aid of funds for the Hall itself. Great Alne Memorial Hall is behind the green, & opposite the Old Station House which is "Pinned" on the map below. On + or - cLICK on the MAP. To return to the top of THIS page - CLICK here This one can be copied - free of any link.